Phuket. Merely uttering the word brings conjures exotic images of sparkling waters, sunshine and stunning resorts. 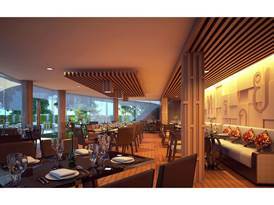 And that’s exactly what’s on offer at Novotel Phuket Karon Beach Resort and Spa, located by the waters of the Andaman Sea. Described as “spacious and contemporary in design with high-end technology”, the resort features high-speed Internet and a 42 inch flat screen TV in every room, as well as 25 suites and rooms with plunge pool access. Guests can indulge by the Lagoon Pool, designed to complement the resort’s landscape, or relax in the Oasis Pool with its “chill-out feel and butler service”. There are also two restaurants, a sports bar with big screens and a pool bar and grill. 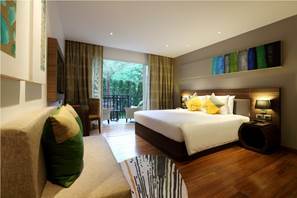 As the name indicates, the resort also features a spa and fitness centre. 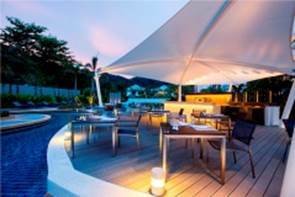 Novotel Phuket Karon Beach Resort and Spa is close to the area’s second biggest beach which, in turn, is a short drive from the bustle of Patong.